Managed by Ernakulam- Angamly Archdiocese. Phone: 0484 - 3217225, 0 9447577770/9447577771. As an infant starts getting older, his parents start thinking about putting him in kindergarten or pre-school. The question that hounds almost all the parents is - what is the best age to start a toddler in school. This is because if the child is not prepared for going to school, it will have a negative effect on his learning abilities. Usually, kids start kindergarten around 5 years of age. However, while deciding the proper age of their child to start kindergarten, the parents should also keep in mind factors like his emotional maturity, social skills, confidence level, and so on. You child will be learning many new things in school, apart from his lessons. Before sending him to school, make sure that he is ready to learn and acquire new skills. How do you do that? Very simple! Just use the check list given below. If the answers to most of these questions are in yes, it is the time to let him move on to the new phase in life. Can he identify rhyming sounds? Is he able to listen to stories, without interrupting time and again? Does he know that his actions have consequences? Can he differentiate between different times of the day? Is he able to trace certain basic shapes, like circle, on paper? Does he follow the rules you have set for him, like not going out alone after dark? Can he speak in a coherent manner? Is he able to speak sentences of atleast 5-6 words? Does he identify alphabets and numbers? Can he differentiate between things on the basis of color, size and shape? Is he able to throw, catch and bounce a ball? Does he react to common words like don’t, stop, etc? Once you have made sure that your child is ready to learn new things, it is the time to check his emotional maturity levels. If you child is not ready for the social interactions that will be required for staying in a pre-school, it is better to let him remain at home for sometime more. The questionnaire given below will help you ascertain your child’s maturity level and in turn, his readiness for school. Is he able to share with others? Is he willing to participate in games with other children? Does he look interested in school? Can he co-operate with other children? Will he able to handle the emotional strain of attending school? Does you child find it easy to mingle with other children and make new friends? Will he listen to his teachers? Is he able to go to the bathroom by himself? Can he eat his food without your help? Does he mange to button his shirt, pant and coat? Will he be able to control himself? Can he stay without you and still be happy? If you answer to the majority of the questions asked above is yes, then your child is ready to go to school. If the majority of answers are no, don’t worry. Run through the checklist again, after every 15-20 days. Please don’t hurry to put your kid in school. If he is not ready for it, you will soon be sorry for your haste. School life is a very important part of the life of a child and if he is ready for it, only then will he be able to fully benefit from it. 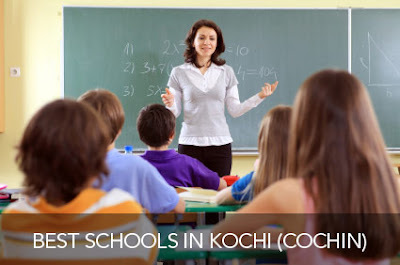 Gregorian Public school, Maradu is not included in your best schools list. Its a very good school overall. and what is the criteria used for this listing.. i'm looking for best schools in kakkanadu for my kids.. thats why i'm so curious on it..
gregorian public school is one of best school in kochi. Any data on MGM school? Surprisingly Campion School is not in your list.For your information campion school is one of the few schools in india which has the Iso 9001-2000 certificate.Hope you update with regard to the above stated.